Antoinette with her glowing smile. An expressive, independent young girl, Antoinette possesses a natural talent for most things and is very motivated – she even taught herself ballet by watching online tutorials. So in 2015, when she became tired, covered in bruises and had a fever, her family knew there was cause for concern. They contacted a doctor, who thought it must be her kidney and wanted to perform surgery immediately. Thankfully, a member of the family with a medical background stepped in and recommended a hospital in California. Living in Mexico, the family decided to take this suggestion and seek answers in the US. But with Spanish as their first language, it took additional time, testing and hospital visits to receive her diagnosis. 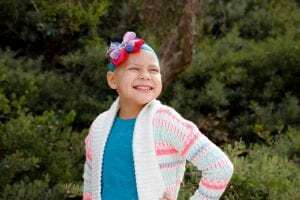 Finally, on July 17, 2015, at eight years old, Antoinette was diagnosed with Philadelphia chromosome-positive acute lymphoblastic leukemia, a high-risk, relatively uncommon disease. The family was devastated. Antoinette needed 20 days of intense chemotherapy, followed by an additional three years of various treatments. Due to the nature of care required, the family decided it would be best if they relocated to Chula Vista, California. While Antoinette, her mom and two sisters (Aileen, 18, and Jasmine, 15) prepared for the move, Antoinette’s father, Antonio, had to make the difficult decision to continue pursuing his architecture degree and work in Mexico in order to support his family. Now living in California, Antoinette’s mother is her children’s primary caretaker and attends all of Antoinette’s appointments. Relying on one income, finances are tight and the family turned to Family Reach. We stepped in and helped with rent, allowing them to truly focus on Antoinette’s health and wellbeing. Throughout this cancer journey, Antonio says his daughter has kept her “unshakeable spirit of happiness.” She is constantly smiling, drawing and talking about her future plans to become an architect, like her father, and help families in need.